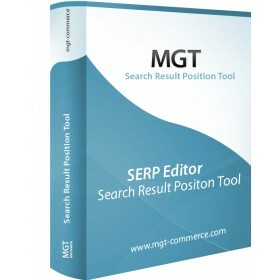 Get full control on your search engine results with the MGT SERP editor. 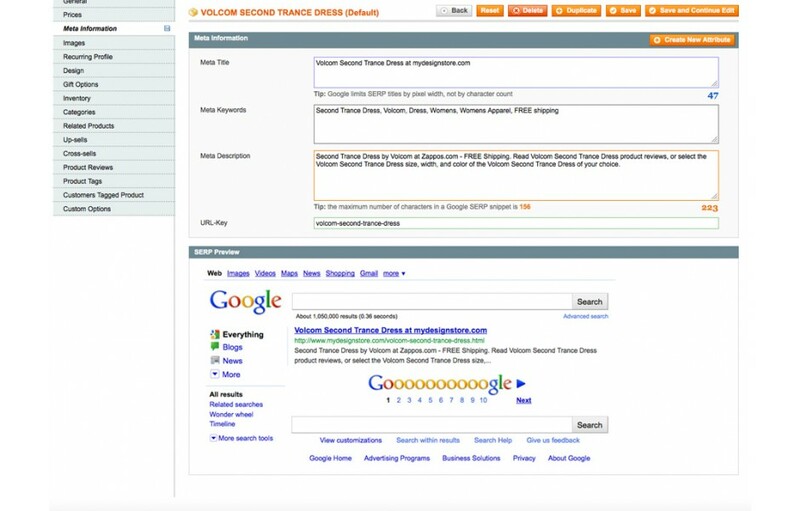 What does the MGT SERP tool for Magento? It's for making sure on what is shown in Google search results. A search engine results page (SERP) is the listing of web pages returned by a search engine in response to a keyword query. The results normally include a list of web pages with titles, a link to the page, and a short description showing where the keywords have matched content within the page. A SERP may refer to a single page of links returned or to the set of all links returned for a search query. To get organic visitors by search engine, it's important to understand, why a visitor clicks on a search engine result. For this we build the Search Result Position Tool (SERP) for Magento, which gives you an exact preview of what the search engine will show, if the search term matches. What means click through rate (CTR)? The click through rate is the rate, that shows how many users click on your PPC ads by the time the ads are shown as search result (Impressions). The CTR is calculated by taking the total number of ads, which are clicked divided by the number of impressions. So the CTR should be an excellent way of gauging the relevance between your ads, keywords and the user acceptance of your ads. What makes the click through rate so important? Optimizing CTR can lead to higher ad positions. Cheaper click costs are known by the AdWords system "Quality Sores". To get an optimal click through rate you should use only targeting and relevant terms. In the best case, the keyword is close related to your product or category page. One way to proof the quality is using the adwords "Keyword quality Score". If the quality score do not match or is low, you need to find new or better keywords. A nice trick is using the Adwords keyword tool for getting some new ideas round about new keywords. All chosen keywords should be grouped according to similar themes. 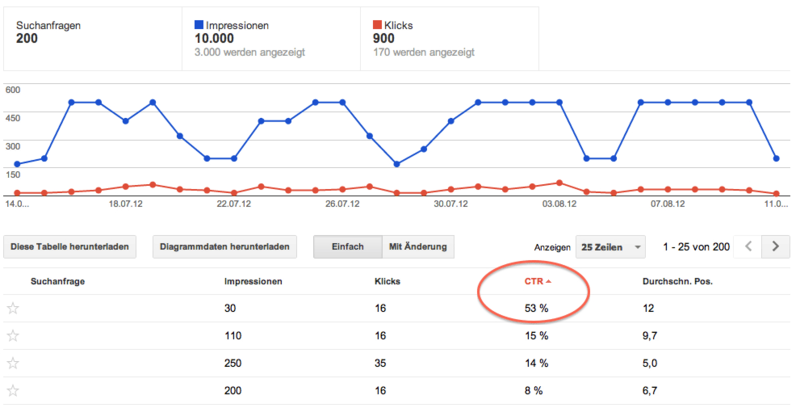 In google webmaster tool you find all keywords which achieving optimal CTR (click through rates). Additional you can do some tests on google Adwords first for finding the optimal keywords faster. Based on this information, you should segmenting your keywords into close and relating keywords, which can used for your ads. Keeping the costs on the lowest level, is a full time job for a professional marketer. Single keywords are difficult to get in the top 10 search results of google. If you like to use adwords for single keywords, you have to pay a higher click price than for long-tail keywords. We recommend to start with long-tail keywords, because you can speak to you customers more direct and you will not loose money by big scattering effects. Make sure, that your terms will match as exact as possible with the interest of your customer's search. How to get the most out of organic traffic? The best way to increase the traffic are the shown ads! Improve CTR by text Ads! The most important line in your ads is the headline! Give your customers a reason to click on your Ads. Try to build headlines, which are interesting enough to click on it. A great way to improve the CTR ( click through rate ) is to set a credibility, trademark or registered symbol to your headline. This is not just for making your text ad looking more professional, it also helps to establish the consumer's trust in a brand. Please take only solid "call to action"! It's perfect for seo optimization, great performance together with cdn. SERP EDITOR is super easy to use, and it returns very good results. Love this plugin. It helps visualize how you will appear in Google search results. Very easy to setup up and work with. Definitely recommend SERP Editor! The person handling my seo seemed to like it. Good learning for merchands to see in live how product will be indexed by Google. Module works fine in 1.7.0.2. This is an impressive extension.... Great job. This tool is very cool ! Thanks for this very cool and free tool! Works just perfect. Just what I was looking for! Good SEO practice says design for humans first, robots second. This SERP editor helps you with just that. While it's easy to stuff your meta info with keywords, this editor lets you 'see it' on google, and help you write better meta info, that web surfers want to click. Great Extension, really useful especially for the visual preview. It works great for Magento 1.7.... Thanks a lot! I love this extension. Like all the "free" extensions I have installed from MGT Commerce it worked out of the box without a glitch. But this extension is one of my favorites because it gives you a "picture view" of what your product listing will look like in Google search. Very professional. I always thought Google went by character count but in the documentation with this extension I learned Google goes by pixels. I really like the idea behind this extension. The problem is that you dont need to edit the meta tags if you dont want in Magento. Everything is generated from the title and description, and it would be great if this extension displayed that content, so you could see if it was nessesary to add new data. I really like MGT-software in general and try be updated on what are released as this is one of the #1 supplier of good Magento code as i see it. Great extension & installation without issues. Einfach geniales Tool ... vorher war ich immer auf einer anderen Seite checken, jetzt sieht mans gleich. perfekt! Danke. 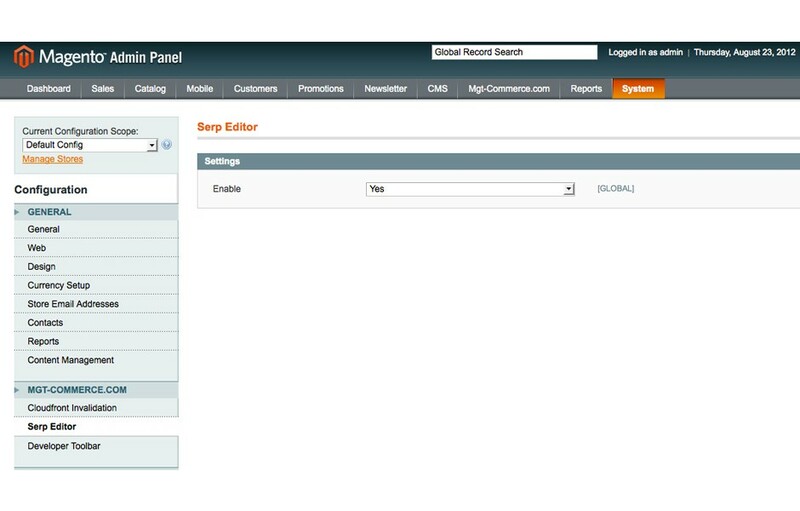 I recommend to every Magento shop owner this extension. It's free and very useful. What a amazing seo extension!